THE GREAT DESIGN feature of the Wishbone rig is that it tucks two baited hooks close behind the lead weight creating minimum drag for maximum range. 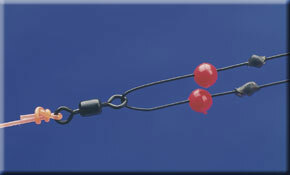 This rig has various uses and while it is the perfect solution to fishing far off with two single baits it also allows a combination of baits or cocktails to be used in tandem. It is recognised as the perfect bait delivery system for all maximum range fishing challenges. It is also a match fishing favourite for taking dogfish and whiting as well as rays, smoothhounds and other summer species that feed at long range. 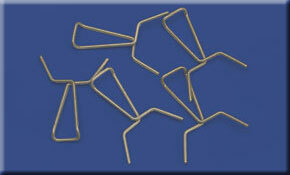 The Wishbone’s one restriction is that it is easily tangled and is therefore best suited to strong tide situations, although this trace tangles more often during the retrieve. This is a power casting terminal rig so top quality components must be used throughout. Rig bodyline must equate to 10lb breaking strain for every ounce cast. This means a 5oz lead should be cast in conjunction with 50lb mono and a 50lb leader. 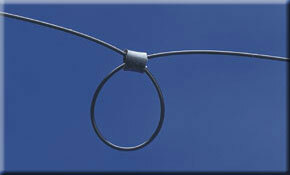 In fact, we would recommend you raise the safety factor by using 60lb line. ● Using three different colour lines for the hook length (black), the main snood (orange) and rig body (white) makes untangling easier. A thicker 30lb line for the main snood (orange) also helps prevent any line twist and tangles. 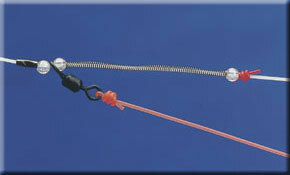 ● The overall length of the hooklength and the hook snood on the Wishbone is optional, but the rig performs best with the snood containing the hooks one third of the length of the total snood length when the rig is clipped down.